These are my Berry 1st Birthday Invitations. Most of the cards and invitations that I make usually fit the A2 envelope. 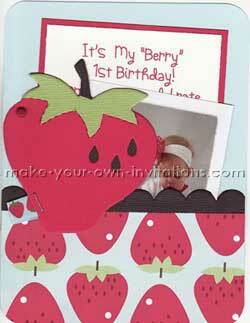 This strawberry birthday layout I created a pocket invitation and rounded the corners. You can take a long strip of card - say 8" x 4" and fold it lengthwise at about 3" to create the pocket. Trim it with coordinating paper or ribbon to decorate it. Use glue or double sided tape down the sides to stick finish it. You can see the pretty paper used here is a strawberry pattern - so sweet for a baby birthday. Attached is a strawberry die cut embellished with a little bit of strawberry ribbon to complete the theme. It is stuck to the back of the pocket with a brad so that it swings out, just for a fun little effect. We typed 'It's my berry 1st birthday' and the rest of the invitation details onto card then matted it on to red cardstock and slipped it into the invitation pocket. I believe the font that I used is CK Fresh.